HOUSTON (AP) — There’s no hiding it. One edge the New England Patriots have over the Atlanta Falcons in Sunday’s Super Bowl can’t be denied: experience. It’s a factor never to be scoffed at when the AFC and NFC champions meet for the league title. Sure, New England (16-2) has a bunch of young players — 16 with four years or less in the NFL — and the Falcons (13-5) actually have four guys who have played in a Super Bowl: Dwight Freeney, Courtney Upshaw, Dashon Goldson and Philip Wheeler. Don’t let that mislead you. 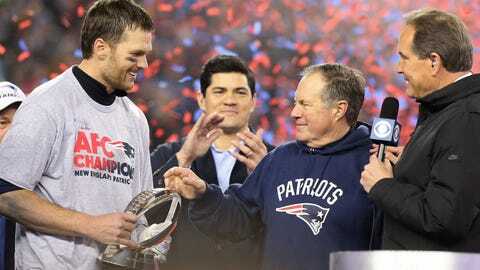 When a team has a quarterback and a coach in their seventh Super Bowl together, along with a slew of players who helped it win the championship just two years ago, well, that’s the kind of experience that can be key. “I’ve got a good regulation of my emotions and I know when I need to get amped up and I know when I need to relax a little bit, and I think you learn those things,” said Brady, a three-time Super Bowl MVP who’s 4-2 in the game. “It’s a long day,” Brady said. “I mean it’s a long day because it’s been a long week because there’s a lot of things you’re doing. You’re doing a lot more things this week than you normally do for a game week. Just to get to the game, it ends up being … a four-hour game? A longer pregame and a longer halftime, so … it ends up being 4 to five hours. The Falcons aren’t discounting the edge of having been down this path. Freeney, who won a ring with Indianapolis at the 2007 game, believes the mental approach is critical. “I was 24 or 25 or whatever I was,” he said of playing in the Colts’ victory against Chicago. “My body and everything was just on a whole different level, which is to be expected at that age. “I think that from a mental standpoint, it’s appreciating the moment. Now it’s a little bit better, because now I realized through time it’s not something that you get to all the time. “You have to treasure these moments, really treasure these moments and try to take a moment to take it all in. I think I can look at it from a different perspective now, which I’m not going to say means more, but in a sense it’s a little more special in a way. There’s no looking at the stats differently, though. Atlanta has never won an NFL crown, is in only its second Super Bowl in 51 seasons of life — a decisive loss to Denver came in 1999 — and rarely has been a contender to get this far. Since Brady became New England’s starter, he ranks first in postseason wins (24), passing attempts (1,263), completions (788), yards (8,628) and touchdowns (61). He has the most multi-touchdown games (19) and most career 300-yard games (11) in NFL playoff history. He will also become the first player to appear in seven Super Bowls, and with a victory would have the most rings, tied with Charles Haley. Quite the resume. Plus, his surrounding cast includes some major contributors in other Super Bowls: Julian Edelman, LeGarrette Blount, Rob Ninkovich, Devin McCourty, Stephen Gostkowski … shall we go on? “Our role always changes,” Brady said, “and still as a leader and as a veteran I still can express things to my younger teammates and see the things that they’re going through, and try to help them through those things because I’ve been through those things.